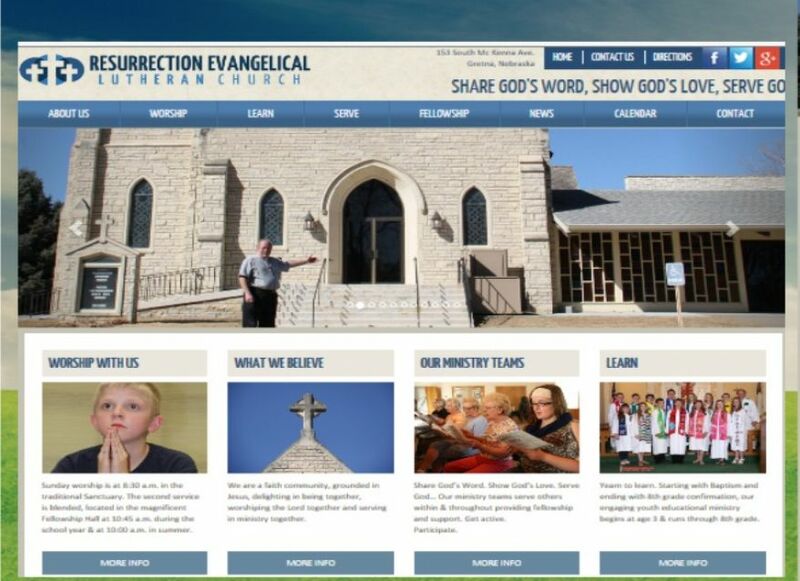 Resurrection Evangelical Church in Gretna Nebraska is the client we did total re-branding for on and offline. Our Omaha Marketing firm designed a new logo, a new mobile responsive website and conducted research and journalistic-type interviews for the extensive website copywriting project. Stern PR shot custom photography and set up all necessary online directory listings and creatively designed the multiple social media account cover pages like Facebook, Google+ and Twitter. Stern PR’s search engine optimization put the Lutheran Church in Gretna Nebraska on the 1st page of Google for most of its keywords. Via effective news release, Stern PR, an Omaha Public Relations firm achieved news coverage in an Omaha World Herald-owned newspaper for the church’s re-branding efforts which helps boost positive community relations and membership opportunities.